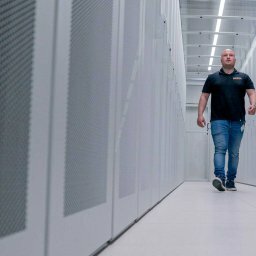 In line with the upgrade of our SDC1 datacenter, our engineers finished upgrading the cooling of all data rooms. All the data rooms in SDC1 have now N+2 cooling which means that in every data room 2 air conditioners can fail and there will be still enough cooling capacity for the IT load. To achieve also hardware brand redundancy, we added Uniflair (Schneider Electric) airco units. This way even software or control failures cannot affect the cooling guarantee. The extra capacity was also added to react to the more extreme global warming weather conditions we currently experience in the Netherlands (summer temperatures have already been reached in spring). Nobody knows what the temperatures will be in the upcoming years, so let us be ready for when that happens. Secondly, the N+2 cooling will be the new Serverius datacenter standard. Now SDC1 is using fully N+2 cooling. In SDC1, the A power UPS is completely renewed. Almost all hardware components of the UPS and all batteries are renewed as precaution. By renewing all hardware components, the chance of a failure is minimized and no large maintenance will be needed in the upcoming years. Currently the engineers are working on the 2N expansion of SDC2. We will publish more information about that on our website later on.